Dual Leveling Amplifier was inspired by the famous hardware limiters of the past, it has two parallel stereo limiters fed by Low Pass and High Pass filters allowing maximum control of the levels with minimum distortion even when driven hard, ideal for mastering. 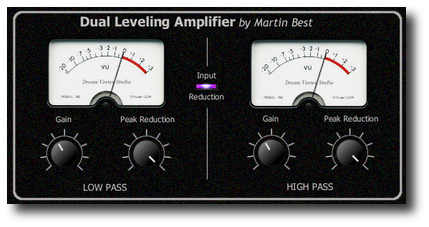 This Leveling Amplifier is ideal for mastering or controlling the dynamic range of a track, it's response to peaks is very fast with a slow release for minimum distortion. A smooth reverb with phase modulation to create air movement for a more live organic sound. This plugin works best as an auxiliary send. This plugin generates stereo bouncing echo's, good for 'Trance' vocals or wide reverb trails on pads, with echoes synchronized to the host BPM, High and Low Pass filters in the feedback loop, azimuth, ping-pong width control, and a level knob that changes to send mode when fully clockwise.